Many of you may have celebrated all things Irish last Friday the 17th March, but did you also know that it marked the seventh National Day of Action against Bullying and Violence in Australia? I think sometimes it seems easier to understand the first two parts of bullying rather than the different types of behaviours that can cause harm. These can be social, verbal or physical and you might consider some of these as more serious? 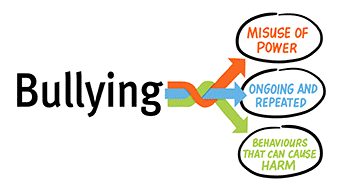 But all forms of bullying can have a lasting effect on those involved and because we are all different it is impossible to tell what the effect may be on someone. Politics both here and overseas have been increasingly causing me to question what acceptable behaviour is and whether we need to be more mindful of social and verbal behaviours. Seeing some of the statements from world leaders about acceptable behaviour definitely ticks the boxes of those features of bullying! But what about here at University? As a student I remember a few times when a member of academic staff had a reputation for behaving inappropriately towards students and at times it can seem like we can’t do anything about such behaviour, especially when it is sitting just below the surface. Scilla Elworthy explores how to deal with a bully without becoming a thug in return. She outlines that in order to deal with bullying we need to understand our values and be able to reflect on how we can manage our fear and anger in relation to these values. She asks you to treat the fear like a child, what does the fear need to feel better, stronger? Scilla also reminds us that the anger we feel can be powerful, rather than getting angry with people and wasting that power using it to make positive changes. I know F ebruary is over, but it really got me thinking about Random Acts of Kindness and how we could put some “good feelings” into Semester 1 here at UON. A Random Act of Kindness does not have to be a big deal, it can be as simple as asking a lost looking new student if they need some directions. Or smiling at someone who looks like they need it, give up your seat on the bus, the list is endless. Random Acts of Kindness take very little effort and energy but can make a huge difference to someone’s day. Imagine the domino effect if everyone here at UON did one small act of kindness this week, or even this month. The flow-on effects would be beautiful. Happier students, less stress, brains more able to learn. Exciting stuff! Have a think about something little you can do. 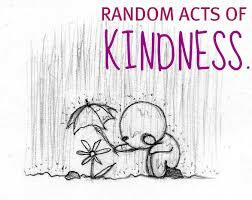 What will be your Random Act of Kindness today? p.s. You might be happy to know that I survived Febfast and did not have a single spoonful of chocolate icing! It was great to raise some money for a good cause; it was also really good to achieve a personal goal!